Maddie was in her room when she got a call from her mom. Valen was sitting outside a classroom in Wirtz Center when one of her friends told her the news. Danny was scrolling through his computer when the information came flooding in. The mass shooting in Parkland, Florida affected everyone who heard about it differently. But for eight Northwestern students, the grief, pain and anger that came after the February 14th tragedy inspired action. 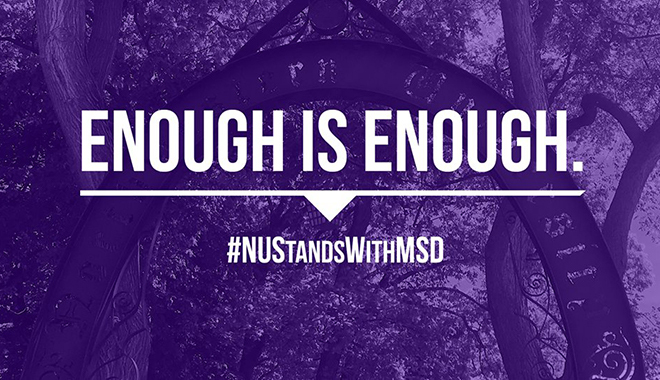 After the Florida shooting, these students created Northwestern Stands with Marjory Stoneman Douglas High School, organizing a series of commemorative events that will occur March 14. With hopes to inspire action from the Northwestern community, the students worked together to plan these events with help from the administration and support from their peers. The events on Wednesday will begin with simultaneous marches from the Rock and Tech at 10 a.m., leading to Deering Meadow where a moment of silence will be held at 10:17 a.m., followed by a series of speeches from NU students affected by the shooting, members of the administration and others. At 6 p.m., a candlelight vigil at the Rock will be held, featuring speakers from Religious Life, opportunities to sign a banner that will be delivered to Marjory Stoneman Douglas High School and a performance of a song written by students at the high school. Valen-Marie Santos and Maddie Gaines, two more students who helped plan and organize, felt the impact especially close to home, being from south Florida themselves and having friends and family with connections to Parkland. The organizers expressed that they want this to be a starting point for more members of the Northwestern community to join together and take action. A voter registration drive will be a part of the events Wednesday, which the organizers hope will encourage students to get active around the issue of gun violence. Beyond March 14, the organizers look to create a lasting impact in the action students and community members take around the issue of gun violence. Above all else, the organizers emphasized the importance of coming together around the issue of gun violence to create long-term change.